If there’s one item I’m excited about incorporating into my wardrobe this year it’s the sequin skirt! So when Lucy from Born at Dawn popped round last week I was lucky enough to try on this fab Sequin Skirt by Belgian brand Essential Antwerp, that makes up part of her new season edit at her gorgeous online store. She stocks the best European indie brands and is a nice change from the usual high street ranges we see everywhere. The skirt is an investment purchase at £115, however, you need to understand that a sequin skirt can be worn in SO many ways, not just for ‘evening/party’. It works well with oversized knitwear, trainers, heels, slogan tee, denim or white shirts, grey marl sweat, stilettos, a blazer… and I will be championing it as daywear this year, so watch this space for more ideas! We teamed the skirt with this brilliant high neck jumper with splits, (which shows off the skirt really well whilst still not feeling too overdressed) which is made of recycled wool. Lucy’s selection of pieces are always thoughtfully considered and curated. I got to try on a selection of styles from daywear, to faux fur and fancy leather pants! This is a selection of my favourite things which I wanted to share with you for some outfit ideas and inspiration. There is also a top version of the sequin skirt which comes in a very nice oversized (slightly shorter cropped length) shape. You can move the sequins around to create different patterns which is also fun :) We teamed the top with these investment worthy Leather trousers/ leggings. OK they are really leggings, but they feel like the best skinny trouser and make your legs look amazing! 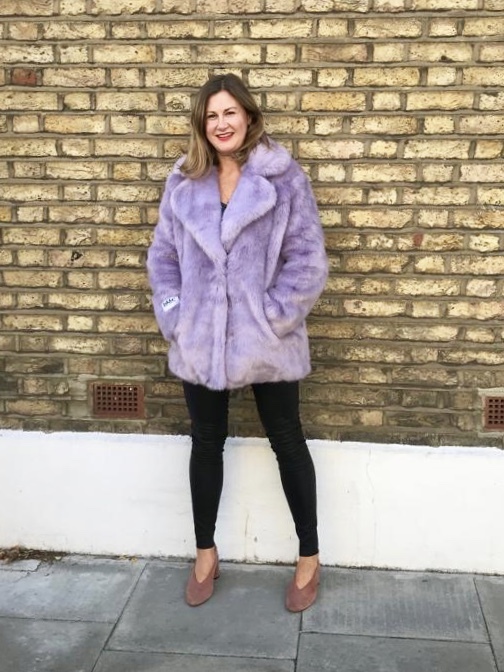 Faux fur is here in a big way and I love this lilac colour one by Jakke. It works well teamed with a skinny trouser but looks equally as good back with blue jeans and white trainers. Another coat style that is being updated this season is the borg/ teddy coat. This camouflage one is really fun and makes a brilliant school run jacket, camo is such a classic print this would make a real hero piece to your casual everyday outfits.